Posted September 12, 2017 by The Rapid & filed under Events. ArtPrize Nine kicks off on Sept. 20. It’s not too early to start planning how you will get to and around this 19-day public art event. Beat traffic the hunt and cost of parking this year using The Rapid as your means of ArtPrize transportation! We’re making it even easier by once again partnering with ArtPrize to feature the ArtPrize Metro Pass. For just $5, you can ride 10 times on The Rapid’s fixed routes and receive unlimited rides on the Silver Line from Sept. 20 through Oct. 8. Essentially, this pass acts as a 10-ride ticket within the farebox of Rapid fixed-route vehicles. On the Silver Line, just be sure you carry it with you to present to the Fare Enforcement Officers you may meet along your way. As if saving money on transit wasn’t a deal in itself, there’s also more to love at the Metro Pass. This amazing deal also includes the perk of an exclusive day pass to the ArtPrize Clubhouse. At the Clubhouse, you’ll have access to a free drink, snacks and a place to rest your feet. There’s also an added bonus of a discount at the ArtPrize HUB/HQ retail store so you can pick up some ArtPrize gear and goodies. Starting in mid-September, head to any of the seven area Meijer Park & Ride locations to pick up your Metro Pass. If you’re planning to park your car outside of Downtown and ride The Rapid to ArtPrize, parking is free in the seven area Meijer lots. Just park and hop on the next available bus with through service to ArtPrize. Bundled with your Metro Pass will be the ArtPrize Nine Event Guide to help you navigate the event. Don’t forget you can also park for free at the Silver Line’s 60th Street Park ‘n’ Ride Lot and take the Silver Line Downtown. 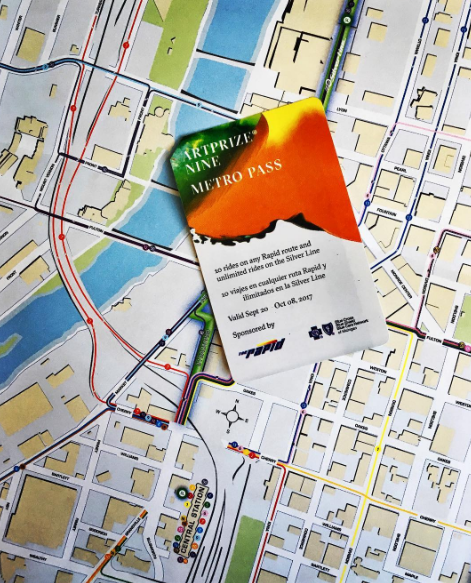 Just be sure that you have your ArtPrize Metro Pass with you during your travels. You can also park on the edges of Downtown Grand Rapids and use DASH West and North to get you to the center of the ArtPrize action for free. As always, there’s a lot more to ArtPrize than just art installments. ArtPrize Nine attendees will have access to ArtPrize on Screen, which is a film festival featuring six feature-length documentary films, each accompanied by a Michigan-made short. This year during ArtPrize Nine, you can also enjoy music at the second annual HopCat WYCE Blue Bridge Music Festival with music from eight musicians and bands from across the country. Learn more about taking the bus to ArtPrize Nine and all that this one-of-a-kind event has to offer here.